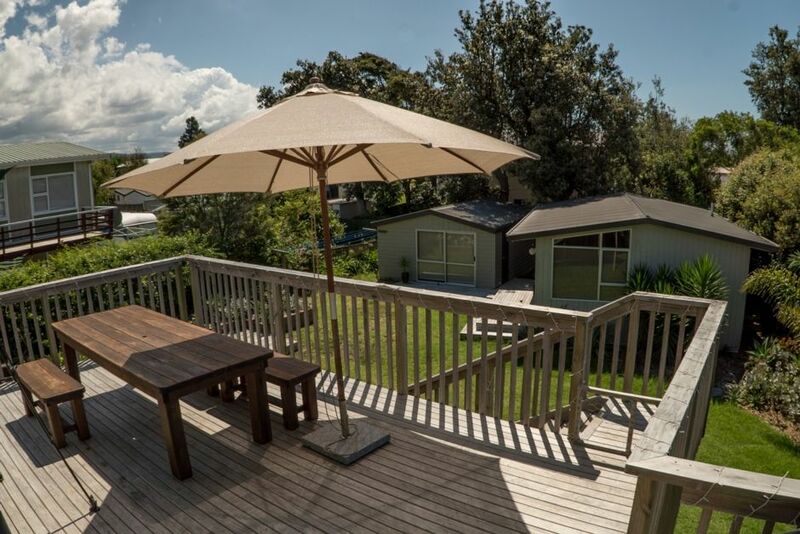 A great kiwi 2 bedroom bach, plus a modern 2 bedroom cottage and separate sleepout/movie/games room all on a full sized site - this is an ideal set up for two families or a group of friends wanting to spread out. An easy 2 minute, 200m walk to all that the beach and the estuary have to offer. And just around the corner is the local estuary dairy where you can hire kayaks, paddle boards, bikes and DVDs and order the best fish and chips! The 2-storied original beach house has two bedrooms downstairs and open plan living upstairs with wonderful indoor/outdoor living flow to the large north facing deck. It has a fully equipped kitchen, laundry (washing machine, dryer, second fridge) and lounge area (TV, DVD player and stereo). The single storied 2 bedroom cottage on the rear of the section has a small kitchen with a table and 4 chairs. It does not have full cooking facilities but has a fridge/freezer, electric jug, toaster, cutlery, plates etc. There is a modern bathroom and a living area with two couches and a TV. The sleepout/games room has a single bed, a roll-out mattress and a table tennis table. There is also a 50 inch monitor for playing DVDs and X-box. There is even an outdoor stage if the kids (or parents) want to put on a show! Although perfect for two families we are able to offer discounted pricing outside of peak holiday time for single families who wish to rent only one of the buildings. No tents or additional accommodation (vans, caravans etc.) permitted. Pets are welcome but are not allowed inside. A bond may be required. Smoking is strictly outdoors only. No parties and any additional guests beyond those booked must be agreed to by the owner. Our family has had the fortune of owning this property for the last 20 plus years. About 8 years ago a neighbour was clearing their site for a new build and this provided us with the opportunity to buy their awesome 2 bedroom cottage to add to the rear of our property. At the same time we lined and carpeted the garage and we now have three distinct living areas that caters perfectly for us, friends and our teenage children and their friends. It is perfectly placed near the estuary and the beach - an equidistant 200m walk to either one! There is nothing better than sitting out on the large north facing deck with friends, hearing the Weber BBQ sizzle and watching the sun go down over the hills. 3 buildings on the one site provides plenty of space for multiple families or adults and teenagers to spread out! Value for money with plenty of space for everyone! Clean and tidy well presented home with the added bonus of a sleepout. The home had all the home comforts and chattels that one wants. Tony was extremely helpful and was proactive in making provision for our overseas family and ourselves from the South Island. The bach and cottage met our needs perfectly. We highly recommend this place that is ideal for one, two or more families. Its location is a few minutes walk to tge beach. We had a great stay at this Bach. Perfect for extended family to all have their own separate areas to stay. Amazingly close to both the beach and estuary which is perfect for young kids. The Bach was lovely and clean and well equipped. Would love to return and stay again some time! This is a perfect holiday bach. We had nana and pop in the cottage and us in the house with teens in the game room. This setup has everything you could ever need. We took lots of kitchen utensils but we didn't need to bring a thing. Its ALL there. Platters, cheese knives, bread boards, every utensil you ever want when on holiday. A perfectly situated clothes line and pegs. You get all the home comforts but your at the beach!! The owner Tony is by far the best, easiest bach owner we have ever had the pleasure to rent from. Highly recommend this bach. You won't be disappointed. We have already booked our next holiday at this fabulous Bach. Really loved this property from the convenience of the out door shower to being able to take our family border collie on holiday with us to the games room and separate spaces for each family and the communal patio for out door dining. Love Whangamata, the beach and dairy just a 5 minute walk away. Awesome holiday, best time, Thanks!